Let’s talk cheese because we are a cheese loving household here. I can name six different kinds of cheese sitting in our refrigerator right now without even looking – asiago, brie, gouda, Parmesan, Boursin, and cheddar (in block, grated, and sliced form). We eat cheese at breakfast, lunch, and dinner and at all the snack times in between. When I want everyone to eat more vegetables without too much whining, I know I should include plenty of cheese in the recipe. This vegetable alfredo lasagna fits the bill perfectly. 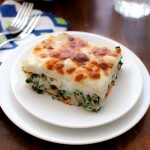 Healthy vegetables are tucked under layers of melted cheese, creamy béchamel sauce, and pasta. I even over browned the cheese when I baked this lasagna and I still got no complaints. Getting your family to eat more vegetables AND having a whine free meal at the same time. That is a win-win for everyone. Heat the oil in a sauté pan and cook the onions over medium heat for 5 to 7 minutes, until tender. Add the garlic and cook for 1 more minute. Meanwhile, squeeze all the water out of the spinach. Add the spinach, peas, and carrots to the onions and garlic and cook until heated through. Season with salt to taste. Set aside. Melt butter in medium saucepan over medium-low heat; add garlic and cook, stirring until fragrant, about 1 minute. Add flour and cook, stirring constantly, for 2 minutes. Do not let the mixture brown. Gradually whisk in milk. Bring mixture to boil over medium-high heat, whisk in nutmeg, salt, and pepper. Reduce heat to low and simmer 5-10 minutes more until sauce has thickened. Remove from heat and allow to cool slightly; set aside. Blend cottage cheese, egg, and salt in food processor or blender until very smooth, about 30 seconds. Preheat oven to 425 degrees. Spray an 11×7 inch baking dish with non-stick cooking spray. Use a rubber spatula to spread 1/2 cup béchamel sauce in bottom of baking dish; position 2 noodles on top of sauce (trim noodles as necessary so they don’t touch the sides of the pan). Reserve 3/4 cups of the béchamel sauce and stir remaining béchamel sauce into the vegetable mixture, mixing well to break up any clumps of spinach. Continue assembling the lasagna in the following order – spread one-fourth of the vegetable mixture evenly over noodles, sprinkle Parmesan over vegetables, and then top with 2 more noodles (trimmed). Spread one-fourth of the vegetable mixture evenly over noodles, sprinkle half the mozzarella or fontina over the vegetables, and then top with 2 more noodles (trimmed). Spread one-fourth of the vegetable mixture evenly over noodles, top with cottage cheese mixture, and then top with last 2 noodles (trimmed). Spread remaining vegetable mixture evenly over noodles. Spread remaining béchamel sauce over top to cover completely and top with remaining mozzarella or fontina. Lightly spray a sheet of aluminum foil with nonstick cooking spray and cover lasagna. Bake until bubbling, about 25 minutes. Remove the foil and continue baking until the noodles are tender and the cheese is golden and bubbling, about 10-15 minutes longer. Cool 10 minutes, then cut into pieces and serve. Genius idea to get in vegetables! can this dish be frozen ? I have never tried freezing this specific lasagna recipe but I think you could freeze it. Cover the assembled but unbaked lasagna tightly with plastic wrap and then with foil. When you are ready to bake it, thaw the lasagna in the refrigerator for 24 hours, remove the plastic wrap, then bake as directed. You will probably need to bake it an additional 15-20 minutes to get it bubbling before removing the foil. This recipe is amazing! It’s very labor intensive but paying attention to each component is so worth it for the result. I was able to just barely fit it all into an Anchor Hocking 8×8 glass baking dish without it bubbling over. Thank you so much for posting this! It’s exactly what I was looking for. I’m so glad you loved the recipe! I was just thinking I needed to make this lasagna again. Thank you so much for coming back to leave a comment. Do you cook the noodles at all first? I use the no-boil lasagna noodles so I don’t cook them at all before assembling. If you can’t find the no-boil noodles, you should cook the noodles until just barely al dente before assembling. Since it’s made in an 11×7 pan, you can get 8 nice sized portions. If you want to cut smaller slices, you could get 12 portions. Thanks. Can this be made the day before needed? I’ve never tried making it the day before but I think it should work fine. You will probably need to bake it an additional 15-20 minutes to get it bubbling before removing the foil. Sounds delicious. I going to makes I thought onions are a no. With I C i’m Just doing the elmation part of it.